SulfaDerm is a sulfa-amino based dog supplement that is specifically formulated for dogs with chronic skin problems. Sulfur, which is the main ingredient in Sweetwater Nutrition’s SulfaDerm, contains amino acids that the body uses to repair and rebuild damaged cells. Amino acids are often called the “building blocks of the body”; they play an essential role in both building cells and in metabolism of foods for energy. The amino acids that are found in the body come together in different combinations to form proteins – and proteins form the cells. Sulfur is found in all living organisms in body fluids, cells and tissues, and is part of the amino acid chain. As the body uses these amino acids, supplements of sulfur are needed to rebuild the damaged skin and coat. SulfaDerm scientifically combines L-Cysteine and L-Methionine, both which are sulfur-containing amino acids that promote the formation of skin cells and play important roles in the detoxification of harmful toxins. These key ingredients are combined with five B-complex vitamins, biotin, zinc and silica, all of which are necessary for the growth of healthy skin and coats. Feed one tablet per day as needed. Biotin is member of the B-vitamin family and a co-enzyme for several metabolic pathways, including the growth of healthy skin and coat due to its role in collagen formation. 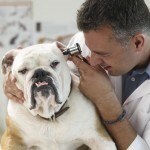 Clinical studies have shown positive results in dogs that exhibited symptoms such as dull coat, brittle hair, loss of hair, scaly skin, or dermatitis. Choline is a water-soluble essential nutrient that is usually grouped within the B-complex vitamins. Choline is a basic constituent of lecithin and is important as a precursor of acetylcholine, as a methyl donor in various metabolic processes and in lipid metabolism. A mixture of related phosphoproteins that is recognized as one of the most nutritive group of proteins, containing all of the common amino acids and rich in the essential ones. The digestive proteins of the casein family goes through a process where amino acid bonds are broken, resulting in short-chained proteins that are easily digestible. Folic acid, also known as vitamin B9, is one of the families of eight water-soluble B-complex vitamins. Like all the B vitamins, it plays a role in the metabolism of fats, carbohydrates and proteins into glucose that the body burns for energy. Folic acid helps the body to make RNA and DNA, the body’s genetic material that contains all the code for new cells. L-cysteine is a non-essential amino acid and can be made in the body from L-methionine and L-serine. L-cysteine is a sulfur-containing amino acid, and contributes to protein structure through the cross-linking that occurs between the sulfur components. L-cysteine is an important structural component of hair; the growth and health of hair depends on an adequate L-cysteine intake. Also, L-cysteine is also necessary for the production of co-enzyme A – a vital enzyme in energy production from food. PABA helps in the utilization of pantothenic acid, is important for healthy skin and hair pigment, has been used, together with biotin, folic acid, pantothenic acid, and sometimes vitamin E, to restore hair, assists in the formation of red blood cells, acts as a co-enzyme in the metabolism and utilization of protein and also helps maintain intestinal flora. Saw palmetto (Serenoa repens or Sabal serrulata) is a dwarf palm plant native to North America, growing primarily along the Atlantic coast in Georgia and Florida. The active ingredients are believed to be found in the plant’s brown-black berries, which are frequently used as an herbal remedy for hair loss. Silica is necessary to maintain the strength of connective tissue such as tendons and ligaments, is required in cartilage formation and also improves the quality and appearance of coat and hair.